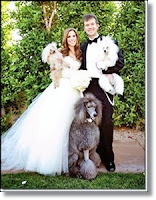 Would you consider having your dog participate in your wedding? Dogs are becoming the new untraditional participants in wedding ceremonies. They are either being entrusted with roles such as ring bearers, bridesmaids, and groomsmen or are simply present during the ceremony to bear witness to their owner’s nuptials. This is probably because dogs are the most socially acceptable pet to be seen out and about with in public and also because they can be trained quite easily to perform at your wedding. There are many advantages of having your pet participate in your wedding day. It’s a lovely way to personalize your wedding day and to bring a smile to everyone’s faces. You don’t have to dress your pet in a tuxedo to raise a smile from your guests - the novelty of a pet being present at your wedding will be enough to make them smile. It also makes your wedding less of a formal occasion and can lighten up the mood which is always a good thing. Weddings are not supposed to be somber affairs! Finally, if you do not have nieces, nephews or little ones to act as flower girls or ring bearer, then a pet is a perfect alternative! In the same way they love to see a cute flower girl or ring bearer walking up the aisle…they will enjoy seeing a dog walk down the aisle, it brings a fun element to the wedding.